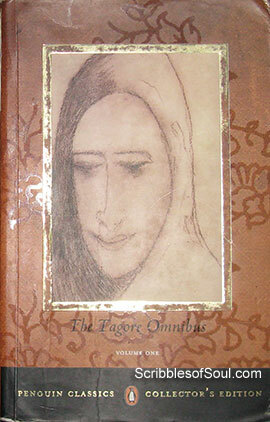 Chaturanga, Quartret is a novella which is short in length, but contentwise, I think, it is the heaviest novel of this book, The Tagore Omnibus. In this novella, Tagore has dealt with lots of philosophical questions regarding atheism and religion. Chaturanga has four main characters, Sachish, Sribilash, Damini and Sachish’s uncle Jagmohan. The novel traces the transformation of Sachish from an atheist to a die hard devotee of Swami Lilananda. The novel philosophically explains the circumstances of Sachish, who is influenced by strict atheism of his Uncle, and renounces even his family to serve the society. However, the death of his uncle shakes his beliefs and somehow he becomes an ardent devotee of Religious Guru Swami Lilananda. As soon as Sachish is sure of his religious aptitude, he is swayed by the love and devotion of Damini, widow of Swami Lilanada’s disciple. At this juncture, he is confused between the three points of a triangle, social atheism, superstitious religion and natural attraction for woman. This triangle is offset by the focal point, provided by the narrator Sribhilash, who is a dear friend and follower of Sachish, in social as well as religious services. As the novel progresses, Sribilash comes out of his friend’s shadow and shines as a practical man, the real hero of this story. Though, initially, I was a little confused about the import of this novel, but as the story progresses, many questions pertaining to the characters strange predicaments are revealed in the effervescent style of Tagore, who always gives a hint regarding the possibilities of future, never fully divulging the entire chain of events. And thats what makes Tagore‘s novels stand apart from others. His novels are closer to reality and are as uncertain and indefinite as life. Another brilliantly written novel, which makes even dry subjects come alive in words.